Our 2016 participants designed and created a presentation sheaf suitable for giving to one of our Australian athletes competing in the Rio Olympics as encouragement to do their best! The presentation sheaf had to feature natural stems. Design styles could include reference to a particular Olympic sport or athlete, or reflect the spirit of Olympics competition or something about Rio, the 2016 Olympics host city. Our 2016 theme was hugely inspirational, with 131 entries received from 10 colleges around Australia! Participants demonstrated a high level of technical skills and research ability, presenting a range of design styles. The judges were looking for a presentation sheaf, with impact and eye appeal from a distance, easy to hold, and reflecting the Rio theme. Participants chose many ways to interpret the spirit of the Rio Olympics – choosing a particular sport, and even a specific athlete, the Olympics theme, or the carnival atmosphere of Rio. Judging considered whether or not the materials selected were consistent with the requirements of the category entered, and also reviewed appropriate choice of materials, good structure, a fitting design, well written design notes provided by the student and the teacher’s assessment sheet. The design notes had to describe the inspiration for the design and include a plant list, as a key goal of the competition is for the students to learn more about their materials – origins, correct names (common and botanical), variety names etc. High resolution photos were essential to present entries in the best possible way. The selection of the wrapping for the finished sheaf was also important, with the judges looking for wrapping that complemented the design without overpowering it. For this competition, a presentation sheaf was defined as a hand tied design, to be presented on a stage (or podium) or sent as a gift. The stems were to be wrapped or bound as decorative wrapping or binding is important as a design element; it could be more or less of a feature, depending on the design. Please click onto the subheading 2016 WINNERS to see the winners in each category - you will find a summary of their design notes and an image. Photos of all entrants in this year’s competition, arranged by college, have also been posted. The competition was open to Certificate III level students from TAFE and private floristry colleges which are Registered Training Organisations (RTOs) across Australia. As an equestrian herself, Julia was inspired by the cross country team. 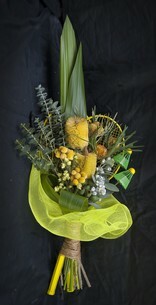 The flowers and foliage selected for her presentation bunch are familiar to her, growing where she rides her horse, and were chosen from local species. Her intention was to remind the riders of home and encourage the team to achieve Olympic success. The excellent quality and well balanced placement of the plant materials, design and professional finish all combined to determine Julia as the overall winner. Her sheaf is easy to hold and features interesting binding and adornment. 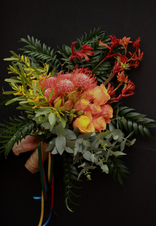 Mia’s interpretation of the vibrant Olympic Flame is represented by the use of burnished red/gold roses and Leucospermum spp. as the focal point, visually and physically supported by kangaroo paw, golden wattle (our national emblem) and complimentary foliage. Overall a stunning representation. Kathryn’s design was inspired by carnival dancers and the Olympic torch. Integrated into her design are vibrant flowers and foliage, and complimentary embellishments, chosen to represent the vivacious colour and movement of the theme ‘Samba’. It is an easy to hold design and Kathryn’s deft construction techniques make this sheaf a stand out workpiece. Leteisha has beautifully interpreted the movement and colour of rhythm gymnastics in her design. 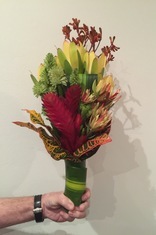 The overall presentation bunch is visually balanced, with the plant materials well chosen, beautifully finished and complimentary to the design. The spiral shapes in this design make it an exciting tribute, with the red ribbons highlighting the yellow of the wattle and red of the Banksia coccinea. This design is very descriptive of Katie’s chosen sport of badminton. Her interpretation is very striking, the plant materials well chosen and placed. The clear cut design style is embellished with green/gold mesh held over a badminton racquet. Liesl’s inspiration for this design came from her childhood in the WA wheat belt. She has used the colours of the Australia bush which are reflected in the Gold, Silver and Bronze of the medals awarded to the winning sportsmen and women. The fluid movement, balance and vibrant colours are well suited to the design brief. The placement of the plant materials, finish and quality is excellent. 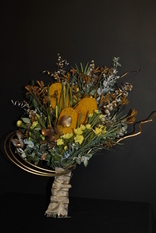 Plant materials have been well chosen - gold leaves, silver eucalyptus foliage together with the bronze of the kangaroo paw and banksias enhance the workpiece. The gold rings encompassing the side of this sheaf and gold in the binding make an excellent interpretive feature.